After such an amazing time hiking in the Cradle Mountain, we had fallen head over heels in love with the Tasmanian wilderness. We knew we had to go back to discover new places and more beautiful scenery. 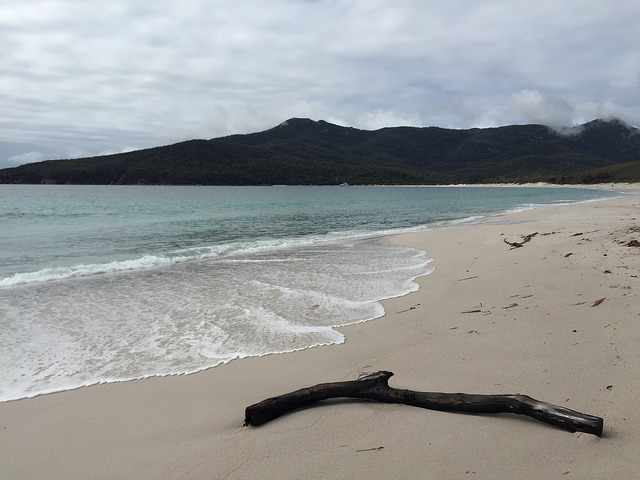 Tasmania has so much to offer which makes it hard to choose where to go. We were heading there over the labour day weekend which gave us a total of three days. 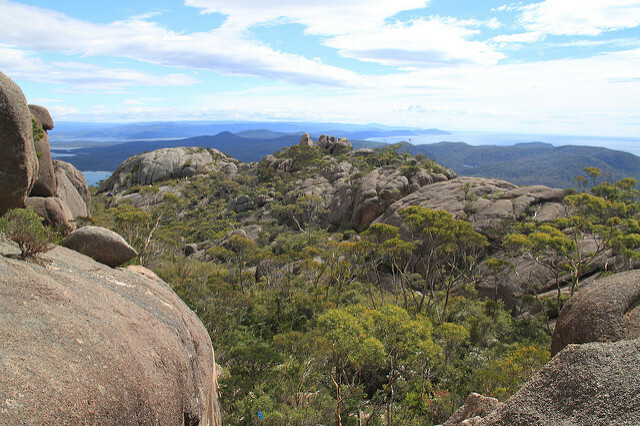 That was definitely not enough to see all of Tasmania, but enough to explore one small part. 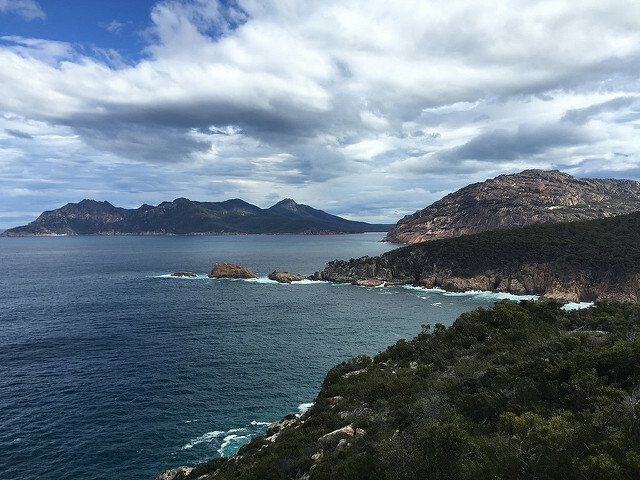 As we had always wanted to visit the iconic Wineglass Bay and Freycinet National Park, we thought it was time to pay a visit to this part of Tasmania. I love researching our destinations nearly as much as I love visiting them; and well in advance I had made a list of all the day hikes that we should attempt. 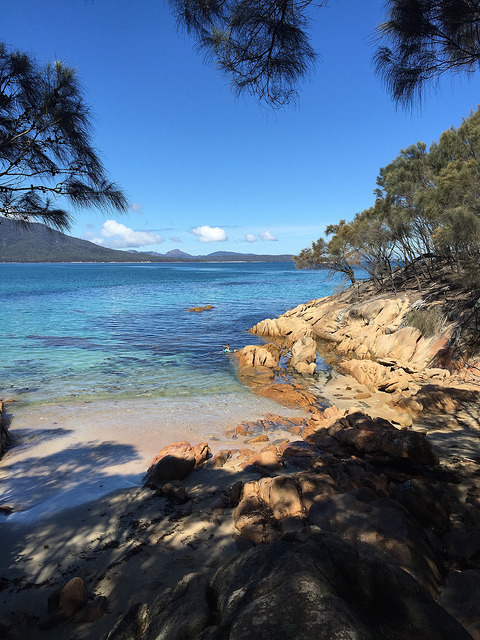 After almost missing our flight (thanks to Melbourne’s crazy peak-hour traffic), an overnight stay in Launceston and a very early two-hour drive to Coles Bay, we finally arrived at the Freycinet National Park. First things first, we needed a strong coffee. 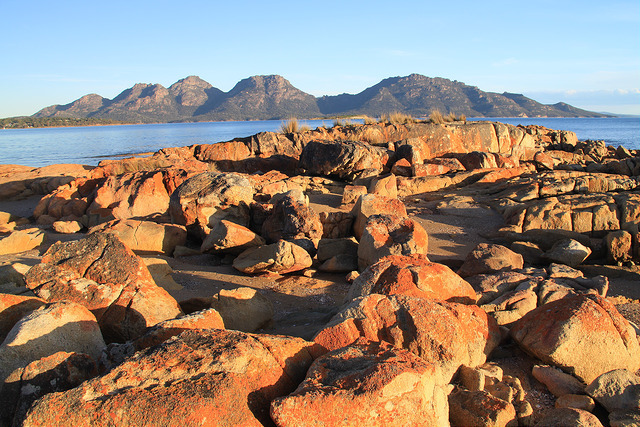 So we stopped at Tombolo Freycinet which makes the best coffees in the area. With our coffee fix sorted out we were finally ready for our big weekend of hiking. After paying for our park pass at the visitor centre, we drove to the Walking Tracks car park to begin our first hike. 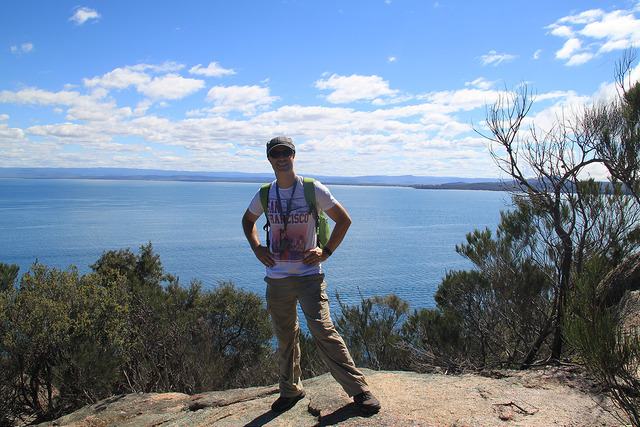 The start of the hike was easy; the first kilometre was a flat gravel path. 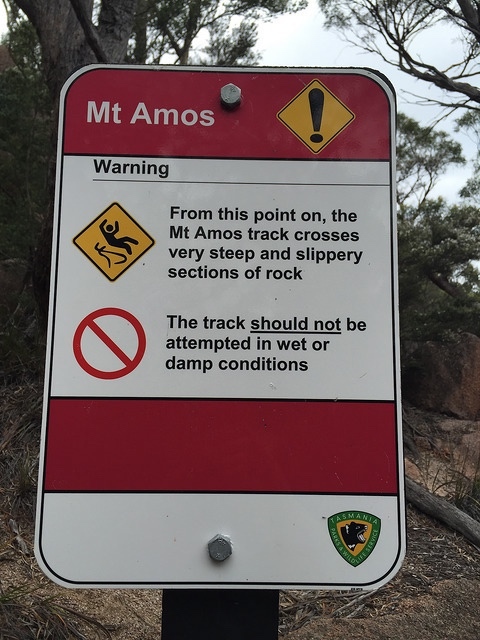 At the end of the first kilometre, we came across a warning sign, informing us of a change in the track condition. 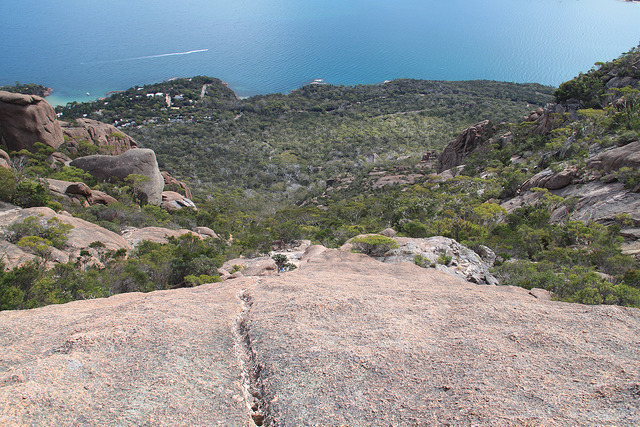 It turned into a steep and demanding path winding over steep slabs of bare rock. As we walked on ahead we emerged above the tree line. 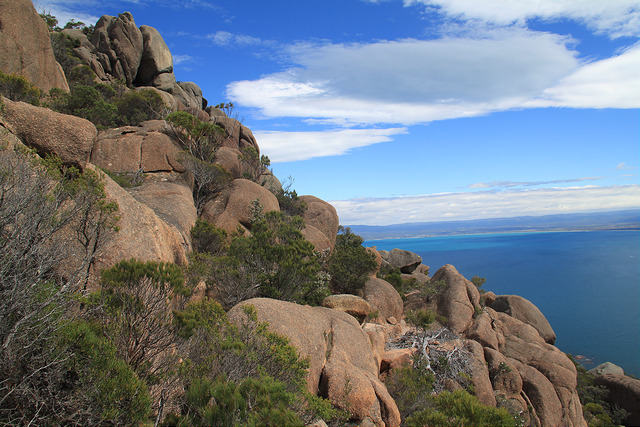 We were suddenly blinded by stunning views of the Coles bay area and Freycinet Peninsula. The steep hike didn’t feel so steep as we found ourself stopping many times for breaks to take photos. Some boulders were extremely slippery. If you plan on attempting this hike, wear proper hiking shoes. The boulders were mostly dry for us but I can imagine how slippery it would be if there had been rainfall the night before! It’s definitely not a good idea to attempt this hike on a rainy day. Another stunning view from the Mt Amos climb! Pulling ourself up over boulders was a bit of an awkward challenge and pretty funny at times, but once we finally made it to the top of Mt Amos the reward was worth it. 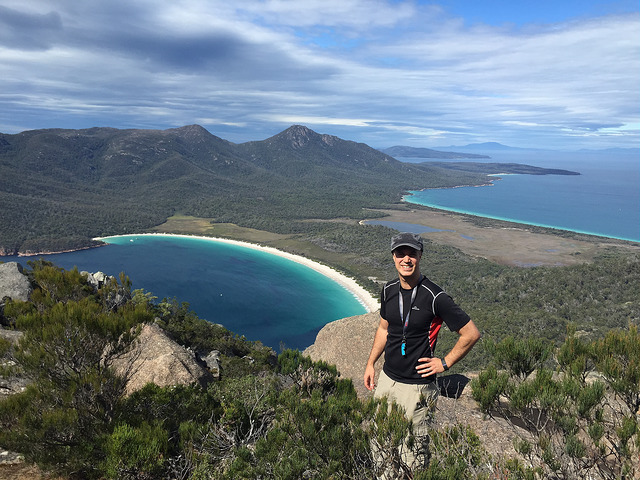 With unmatched views of Wineglass Bay, and spectacular views over the Freycinet National Park, all the huffing, puffing and sweating was quickly forgotten. We started our hike early which meant that we only had to share this view with one other couple at least for the first few minutes. It was so peaceful. We spent a good hour enjoying the view, taking pictures and having a well-deserved snack. By the time we left many other people had joined us to the top and we met many more on our way down. The hike back down was a lot easier but some parts were scarier on the way down as we had to pretty much slide over some of the huge boulders. We sure had a good laugh watching each other getting down in any way we could! It’s rather scary going down! Simon going down a large boulder! 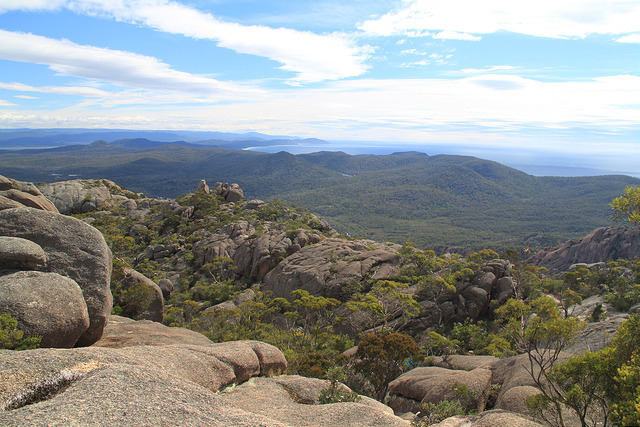 The hike takes about three hours return but you will want to spend a fair amount of time at the top enjoying the scenery. Don’t rush your time at the top. It’s so beautiful; enjoy it! 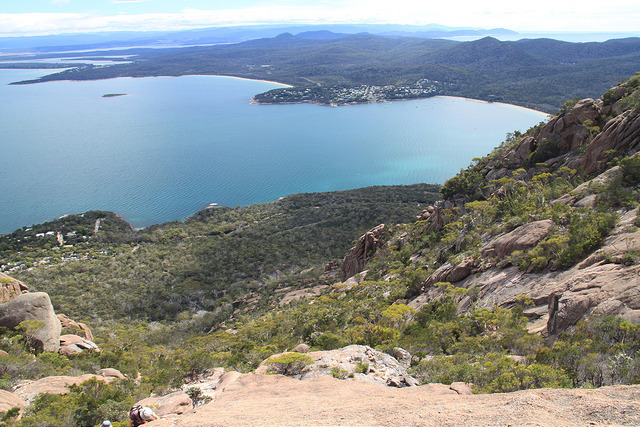 After the hike, we made our way back to Coles Bay to grab a well-deserved lunch and glass of wine at Tombolo Freycinet. 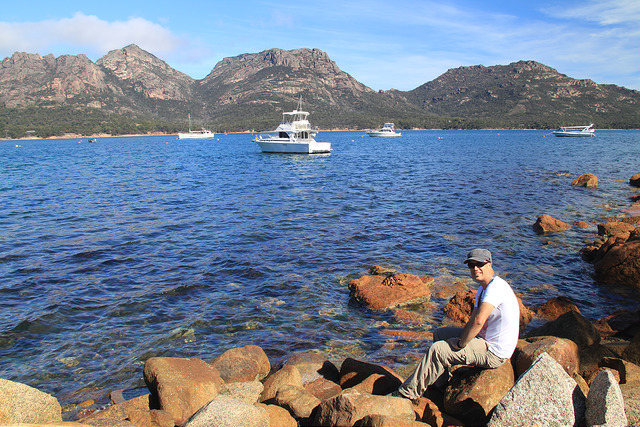 It’s a great place for lunch in Coles Bay with nice local food and splendid views over the granite peaks of the Hazards. For our two night stay, we checked in to the Edge of the Bay Resort. The Edge of the Bay was a lovely place to stay. 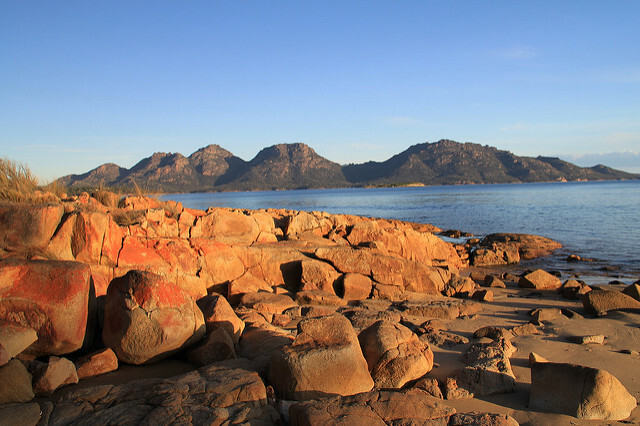 Only five minutes drive from the Freycinet National Park Visitor Centre, the location was perfect. 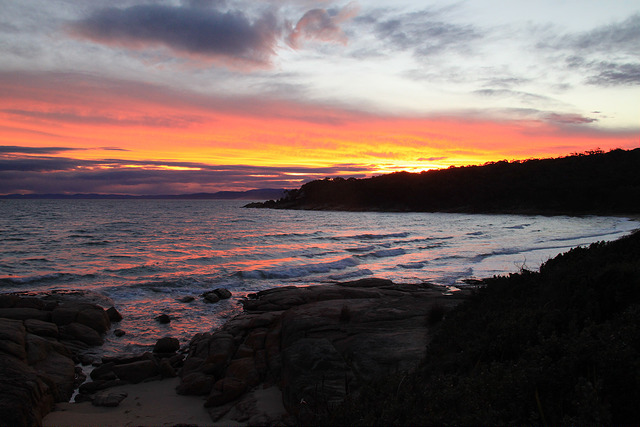 The view of the sunset from the beach fronting the resort was awesome and we had the pleasure to see many wallabies and pademelon during our stay. Our cute wooden cabin was comfortable and also had some stunning views from the bedroom, the living area and the decking area. On our second day, the plan to start our hike early was foiled by morning rain. That’s the thing about Tasmania; you never know if you’ll get a sunny day or a rainy day. Hiking in the rain has never been my cup of tea so we waited for a bit. By 10 o’clock the rain had eased but had not completely stopped. We decided we could wait all day for it to stop or just start hiking anyway. So we drove to the walking track. Starting early makes a difference as we struggled to find a spot in the parking lot. It seemed like nobody else cared about hiking in the rain; just me! By the time we found a parking spot the rain seemed to have stopped; so off we went on another great hike. 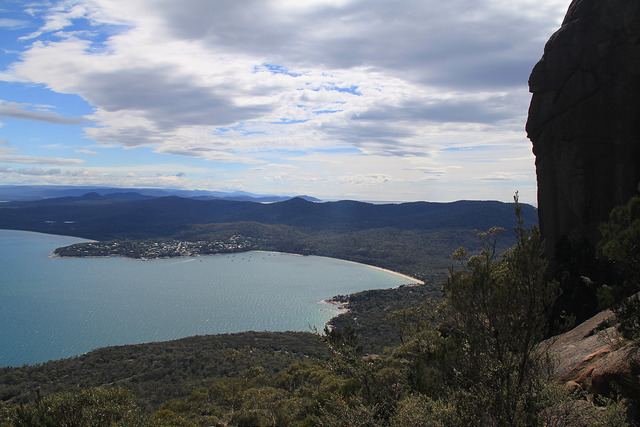 The first part of the hike headed up to the Wineglass Bay lookout. It is a short but quite steep track and takes about an hour depending on your speed and how often you stop for pictures! 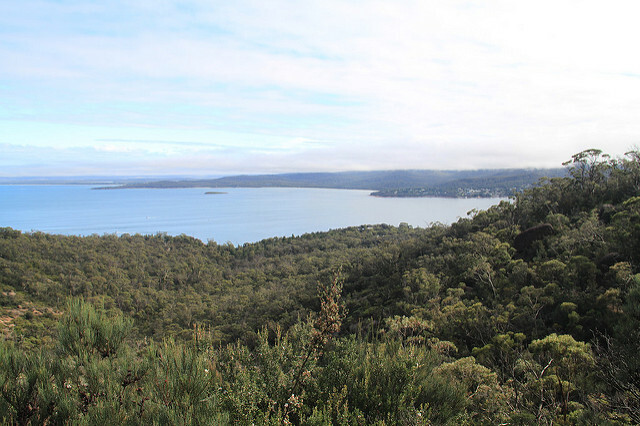 It provides you with fantastic views over the Coles Bay area before you reach the lookout. 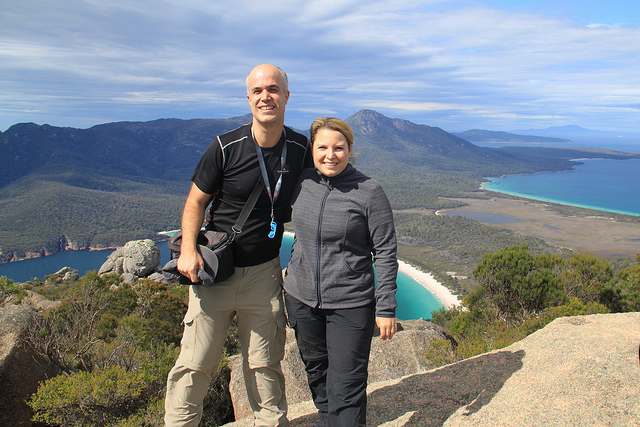 From the lookout, you get a great view of Wineglass Bay and Mt Freycinet although the view from Mt Amos was better in my opinion. When we first got to the lookout our view was obstructed by many clouds. It was annoying but unfortunately, there is nothing you can do about the weather! You can’t always plan it the way you want. We decided to hang out at the lookout for a while and see if the clouds moved away. Eventually, they started to clear and we got a better view. Remember to be patient during bad weather! 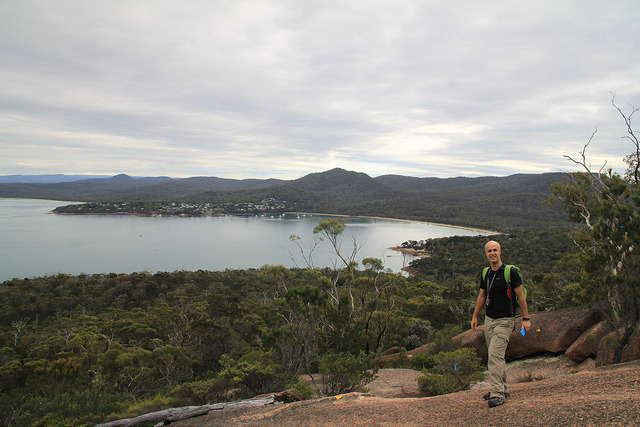 From the lookout, we started following the path down to Wineglass Beach. 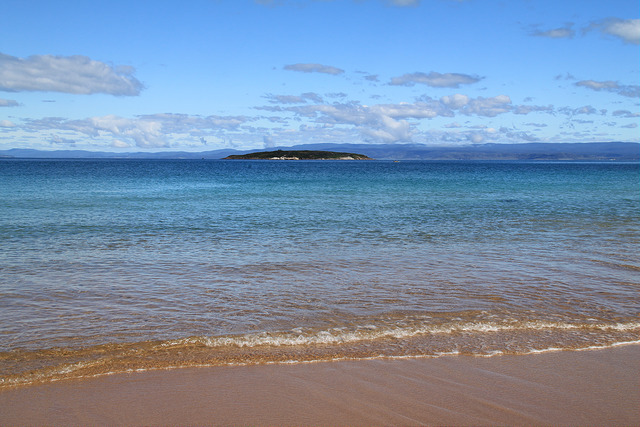 Of course, a trip to Freycinet National Park can’t be complete without stepping on Tasmania’s most famous beach! The path down was quite easy since it was pretty much all downhill. After a thirty minute walk, we took our first step on this breathtaking white sandy beach. 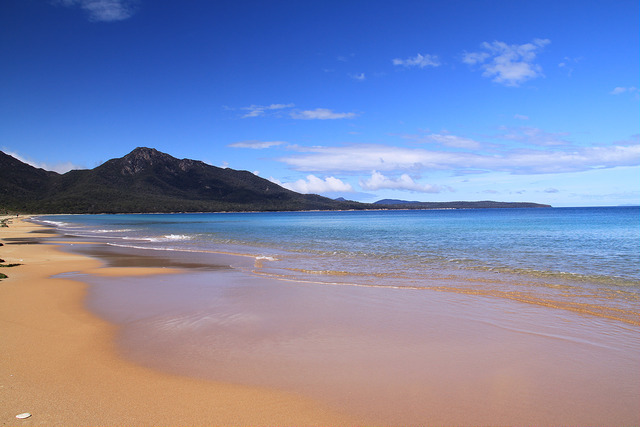 There were a few people at the start of the beach but as we carried on towards Mt Freycinet it became deserted. It was so pretty. Had it been a hot summers day, I would have jumped into that crystal clear water. But being autumn in Tasmania, it was way too cold for us. Instead we spent an hour or so walking on the fine sand, taking pictures and enjoying the stunning scenery we had in front of us. Walking on the deserted Wineglass Beach! We have the beach for ourselves! 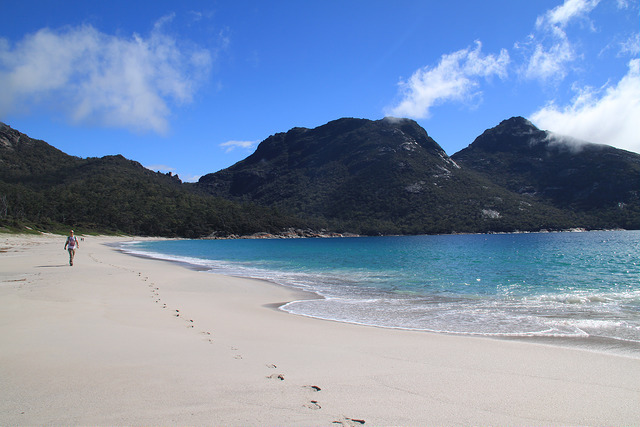 From Wineglass Bay you can either take the same path back to the carpark; or take the Isthmus track on to Hazard beach and then follows the coast around the Hazards. We decided to take this option since the weather had thankfully cleared up and it had now turned into another sunny day! 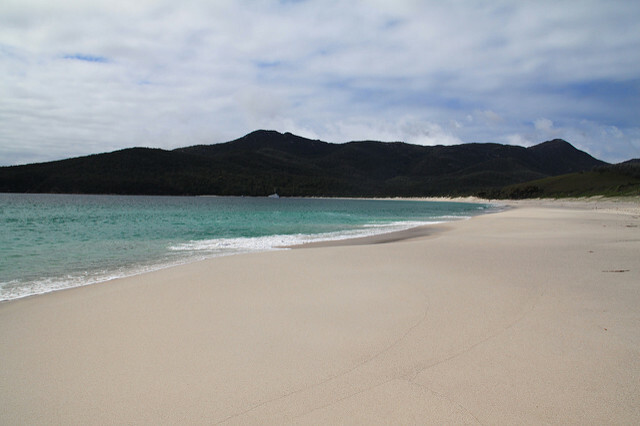 The track from Wineglass bay to Hazard Beach is flat with some boardwalk areas. It takes about forty-five minutes to reach Hazard Beach and it is a peaceful walk. 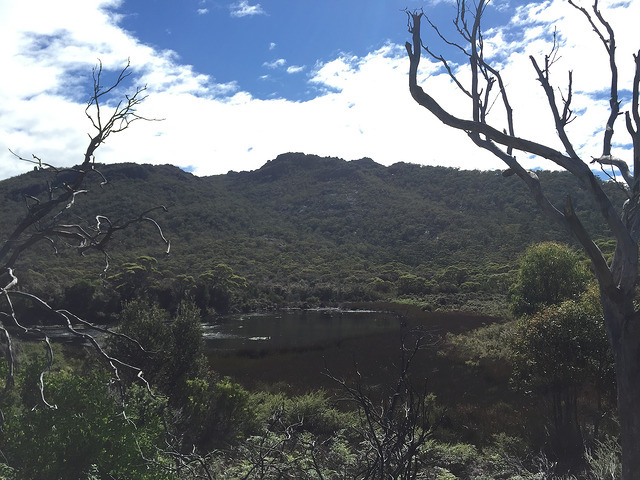 We passed through vegetation and the Hazards Lagoon on the left. Once we got to Hazard Beach, we stopped for a while to take a break and to enjoy another beautiful beach and the splendid views of Promise bay. 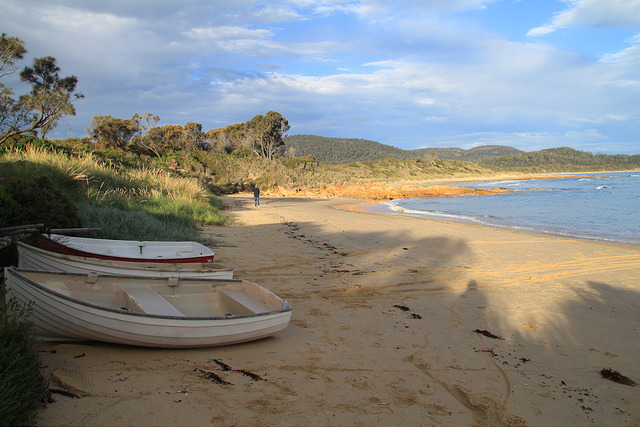 The track heads North of the beach and then follows the coastline back towards the carpark. On the way are many little coves that would be great for swimming in hot weather. There are also many other photo opportunities. The end of the trail is slightly up-hill towards the car park. Reaching the car park my legs were pretty tired! It had been a long day and a long hike, especially since we were still recovering from the Mt Amos hike the day before! I was looking forward to sitting down on the deck of our cabin with a glass of wine, relaxing and enjoying the sunset. A beautiful cove. Perfect for swimming. If only it had been hot! We had kept the easy walks for our last day in case we were exhausted. We also needed to head back to Launceston to catch our evening flight back to Melbourne. 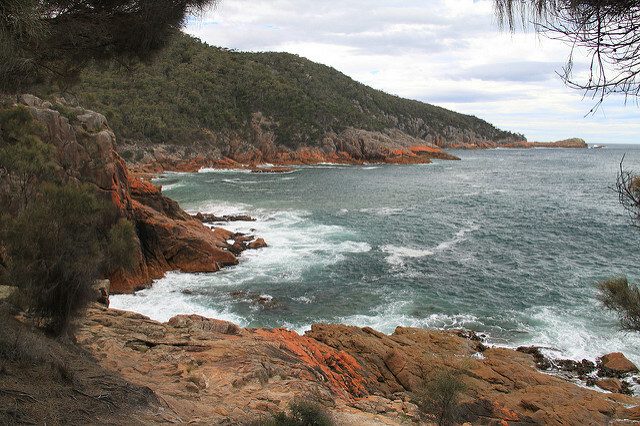 The Cape Tourville trail is an easy 600 metre loop with coastal views of the peninsula’s east coast. We enjoyed checking out the views and watching the waves crashing onto the rocks below. 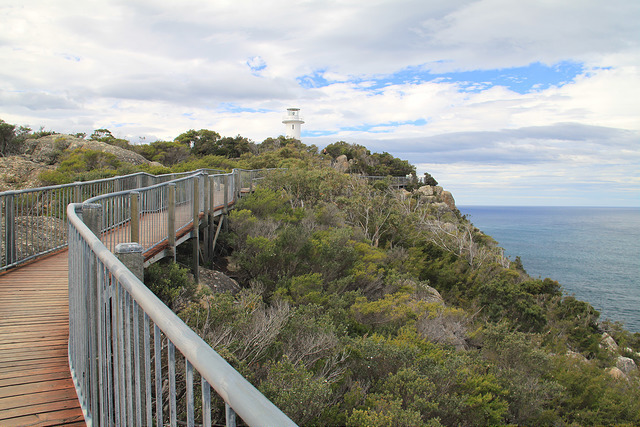 The Cape Tourville lighthouse is quite small and rather unexciting, but the views definitely make this short hike worthwhile. Our second stop was Sleepy Bay. From the carpark, a well- maintained track took us down to Sleepy Bay in about ten minutes. 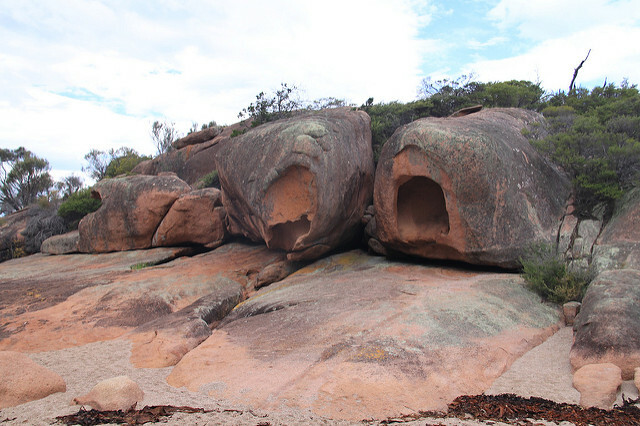 Sleepy Bay offered more sweeping views of the Freycinet Peninsula. It was however not at all sleepy but quite rough! Definitely not a place to swim. From Sleepy Bay we kept walking further for another twenty minutes to the Little Gravelly Beach. 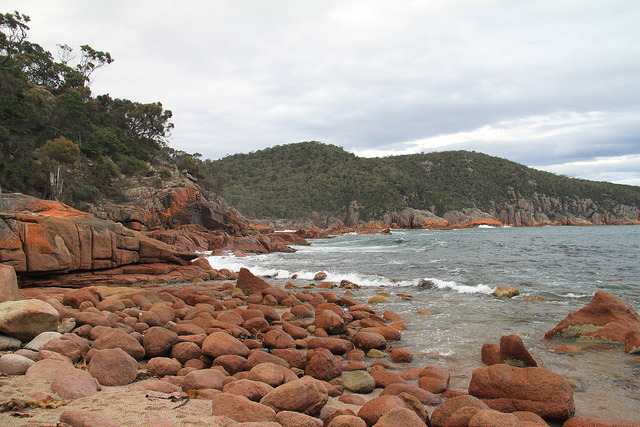 Little Gravelly Beach is beautiful with many pink granite rocks covered in orange lichen. It would have been a great place at sunset! If only we had found this spot earlier! 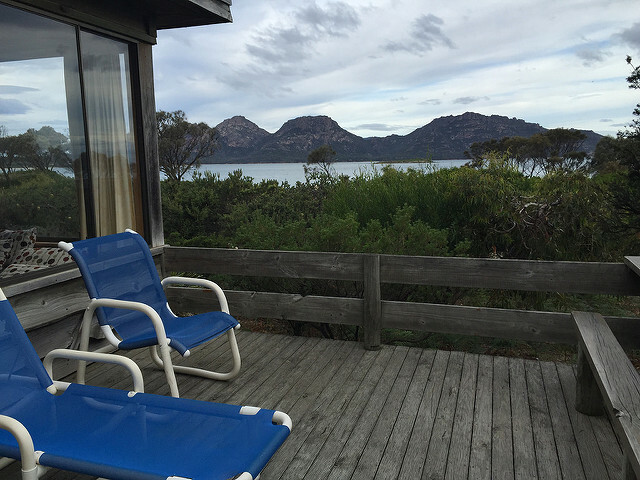 Unfortunately, our time in the Freycinet National Park came to an end and we had to say goodbye. 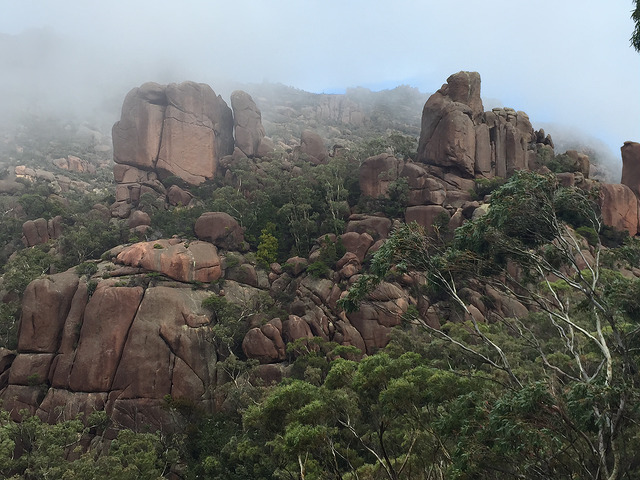 Once again we had a fabulous time in Tasmania and as always left wanting more. But fortunately for us is Tasmania is only a short one hour flight from Melbourne. It is easy to head there for just the weekend. We are looking forward to our next trip in January! This time, we will be exploring the Tasman Peninsula. Love your post!! 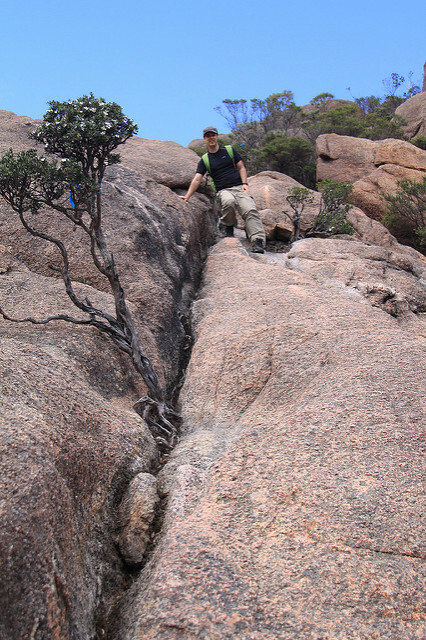 If only have one day, which one of the two tracks at Freycinet NP would you recommend? Thanks Claudia. 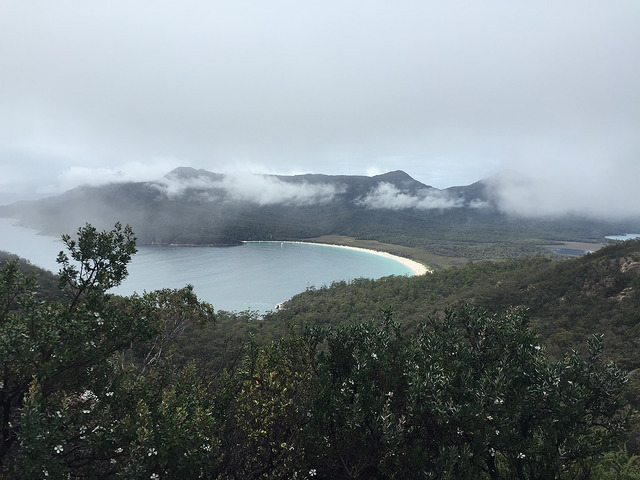 With one day only I would do the hike to the Wineglass Bay viewpoint and then down to the beach. Hope you have a great time in Tassie.